The day we went to see the seals, we did not bring the dog. We deliberated long and hard. The dog objected strenuously to being left behind in the little forge-worker’s cottage turned holiday let. He wanted to be with us, and who could blame him; for if we left this strange place, would we ever return to collect him? We did that pantomime thing where every time we tried to close and lock the front door the dog would, somehow, be on the wrong side of it. We would shut the door, turn the lock and turn to see the dog sitting in the big old Mercedes. Macaulay employed the tactics of those we were about to see: he turned on seal eyes. This is easy for dogs, because they are related to seals. Pinnipeds (seals, sea lions and so on) and dogs are the same order, carnivora. And they are members of the sub-order caniformia, which literally means: “dog-shaped carnivores”. So he turned those big brown limpid pools on us and we felt terrible. But our dog is highly territorial. He barks like a fascist dictator. We could not have him turning our visit to the spit off the North Norfolk coast into his own private rally. No, Macaulay, we admonished him, and he resented us with all his small doggy might, which is quite considerable. And turned up at the boat to find it being supervised by Muddles. 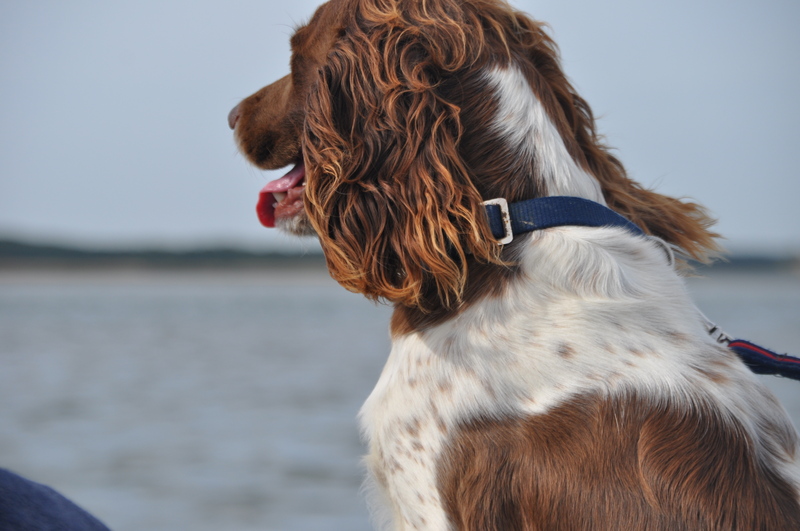 Muddles was a spaniel, with long cavalier foppish ears and a firm sense of being one of the team. This was what Muddles did most days: he trotted at his master’s wellington heels all the way to the boat and jumped in, taking the space a tourist’s bottom might otherwise have taken. Fleetingly I wondered: when the boat is full, does Muddles get displaced, and a further £10 made? There were many other boats going out at the same time. The tide was right, and time and tide wait for no man, or dog. There was another dog on the boat too, whose name I did not catch. I felt a heel. And then the boat started in the kind cool air of a beautiful Summer morning, and Muddles took long draughts of the air, and let his ears fly out behind him. Everyone petted him, friends and strangers alike, and he acquainted himself with the other dog. An English phenomenon. Dogs like that deserve songs to be written about them. The ballad of Muddles. Life on board a boat, on a calm day, is good. It showed on the faces of the tourists. They were full of wonder. And the dogs were the same. They smiled. And when we reached them, the dogs’ cousins gazed utterly unafraid at us, and leaned over and sported and spoke together. They swam after the boat for sheer curiosity and love of the species sitting in it. They showed the same affable personableness as the dog sitting at home in the holiday let does for us. We loved the company of Muddles and the tourist dog, but we hared home to find our little member of the carnivora order. We longed to see the same content smile on his face as on all of theirs. Hi Mary Anne! Glad you enjoyed the story….the dogs somehow put an extra shine on the whole trip. Wonderful place and fantastic creatures. I love those big old wooden launches. When we used to holiday in Dartmouth (back in the 80’s), in a waterfront house, we would hire such a boat for the duration of our stay. It would plough happily, and securely through rough seas and equally serve as a lorry for taking children, animals and beach gear for a day’s outing at little beaches only accessible by boat. Lovely post. Once you have a boat, Roger, it opens so many doors. No guilt. 🙂 He’s probably already forgotton. Sounds like it was a wonderful adventure and you got some fab shots out it. Thanks, Jamie: it was a brilliant day. There is a place in California where one could cavort with seals, in a little bay or inlet. We took the girls there once. They loved it, especially our Katy, as a seal took special delight in her presence and kept brushing up against her. Delightful post, Kate, and love the pictures of the spaniel. Hope Macauley forgave you in due time. As Penny stated, Kate, there are places up the coast of California that look just like this wonderful spot! I’m not sure the difference, or similarities, between your beautifully photogenic seals and the California seals…Mr. Google can tell me later when I look this up! And I had no idea that dogs were so closely related, but you’re so quick to notice the same look in the eyes! I see it! Muddles is a beautiful dog. What a fun day! I’ve only seen seals in California, like Penny and Debra mention above. We have otters here, but they are not nearly as cute or friendly. I’d love to see otters. I have never caught them in real life….they are timid in England. I’m off to an old mill on a river where they are said to be today, Andra. Maybe today will be my lucky day. I hope you spotted otters today, Kate. We love watching the ones that visit our lagoon. Especially when they play on the opposite bank. If Macaulay is anything like our Maggie & Becky, he no doubt could smell Muddles on you and your family and gave you that look of “and tell me again why I could not go?” Maggie will sit there and check out all “the smells” on my clothing and Becky will give me the cold shoulder and go lay down with a grumble. Lovely dog, that Muddles – you can see he feels at home on the sea. And poor Macaulay, I’m sure he would have enjoyed exchanging barks with the seals. He would have loved it, but we would never have lived the trip down, I suspect, Ruth! I had no idea that seals and dogs are both of the order carnivora. Looks like a great day on the boat. Thanks for sharing your fun pics. BTW: I swung by the Summer Wayfarer site to find that her time on the ways is winding down. Looks like she covered lots of ground (and slept on the ground too). Ouch. OMG has JanH seen this? She’ll be there like a shot. Poor Macauley, but I take your point. Let him come to das Boot one day and he can have his time afloat too. Dogs shouldbe a part of our every day lives. They used to be. In the Netherlands they are still managing it. I am suddenly understanding why at every generla election, one of my nearish neighbours puts ornaments of dogs in the windows and a big poster that reads Vote Dog! In Norfolk, they are a way of life, Isobel! I had no idea but it was so lovely to have them everywhere, accepted on all the tourist attractions and petted in the street. Lovely. Ha! he’d love your neck of the woods, Celi. I never knew dogs were so closely related to seals – but now with your wonderful photos I can see the similarity 😉 I think the Ballad of Muddles must be written – what a wonderful dog – my dogs would be like Macaulay – totally untrustworthy in exciting places. I know, Gabrielle; and there’s Muddles, serene, always there, day in, day out, silent and respectful. You have to hand to to him. What a delightful outing this must have been. And all the better for Muddles’ presence. I had no idea dogs would receive a seal of approval! Didn’t you feel guilty enough to go again but take Mac this time? I love dogs and I love seals, but like so many of your other commenters, Kate, I had no idea they were related, either. It’s too bad you couldn’t take Macualay with you on this outing, but if he’s inclined to behave like a maniac, I think it was wise to leave him behind. It’s very hard for us to take my sister’s dog, Thurber, anywhere. He’s a nervous wreck in the car. But he is also a screamer when we go out without him.